“Is your trip as wonderful as you were expecting?” is the most frequently asked question from our friends. I always answer the same: we have some days easier than others. Travelling and living on the boat is not the same than being on vacation on the boat. Full time parenting is exhausting. In the old days, when we were working parents, we could give the kids a lo of attention over short periods of time. Now we have to find the right balance to avoid being kids’ slaves. We are still adapting and learning how to set limits and make the kids as autonomous as possible. Logistics (things like grocery shopping, laundry, water making, etc.) are not as easy as when living ashore. Washing machines are not always available (we’ve been hand-washing cloths for more than a month…) and we do not always find all the goods that we would like in the local supermarkets. 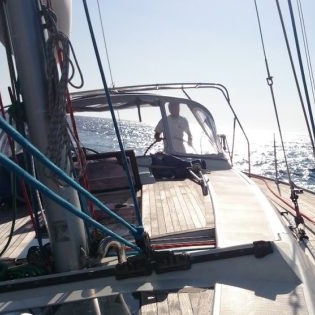 Sailing is not always a relaxing experience as one might think, especially in the Med where the wind changes several time a day in direction and intensity… but hey, at least we knew that. On a boat, there is always something to fix. The toolbox is always out: air entering between the diesel tank and the engine (fixed after 3 months investigation…), fresh water leaking from who-knows-where (this was just a leaking screw on top of the roof, water is entering when washing the deck, arg), etc. Boat maintenance is not only difficult because everything is packed and merely accessible… the main problem for us is the constant brain pain of trying to keep one step ahead in term of maintenance, in order to avoid getting into troubles. We keep being flexible and so far the freedom that we have is worth all the challenges. The contact with the nature transports us to a mystic place where we are constantly living in the present, we can feel the animals and realise how big and fragile is the universe. We love this feeling and it is well worth all the “suffering“. We have the chance to visit new places and meet new people that shares the sailing passion with us, we love this intense moments talking about sailing and nature (and protecting it)! From Trapani, we wanted to go to Malta directly but we were all very tired, specially the kids. After a couple of hours sailing we decided to stop by the Sicilian coast and spend a good night at anchor. We anchor in front of Selinunte archaeological site (absolutely pure luck). The following day, we left for Malta: we then crossed a fishing vessel rail (Italian fishing boats south of Sicily) and a cargo rail (cargos going from Suez to Gibraltar, and reverse). In a final attempt to fix the engine (air getting into the diesel pipes), Pierre broke it 🙂 It took a night of head-scratching before going back to it and fixing it for good. On the next day, we arrived on Gozo island, we anchored in Dwejra, a beautiful tiny and round bay closed to the disappeared blue window. We finally inflated the SUP and we had a lot of fun. The weather was very hot and humid, we hardly slept at nights. Kids and Pierre were sleeping outside (in the cockpit, on the fore deck, where ever possible). After a couple of days around Gozo, we went to Valletta. We stayed at Marina di Valletta where we had the first contact with Maltesse citizens and my friend Clara joined us for some days. We adopted Clara as a crew member in one of the most difficult weeks on the boat, the heat and humidity was killing us, kids were tired and very demanding. I had an ear plug, nothing serious but very uncomfortable. I went to see the doctor and after some days of ear-drops, the doctor finally remove the plug. We all loved Malta. Malta is one of the most beautiful country that I have visited (although the coast is not great at all, compared to some other Mediterranean islands). Going around the island and the cities is what we enjoyed the more. Maltesse people are really friendly and they are always willing to help. We enjoyed the Marina ambience and Breno and his family hospitality. We also met Francoise, Philippe and Élodie from Maélo sailing vessel and we sailed with them for a couple of days. Philippe told us that he was suffering from a skin cancer ; we appreciate he shared with us. Being all day below the burning sun, we have been concerned about protecting from the sun since the early days. We occasionally use sun lotions, but mostly we try to avoid being exposed directly to the sun (we use awning and clothes. From now on, we are being even more vigilant than ever with the sun. Only future will tell if we are right about schooling. I enjoyed reading about your sailing adventure with your young ones. We spent six years sailing around the world with our two children many long years ago. So it exciting to see other young families doing the same thing today. We too loved Malta. Felt like we were transported back the the middle ages. But then we are from America. Everything truly ancient leaves us in awe. Wahou! 6 years sailing with kids, and many long years ago: without electronic charts, GPS nor internet…: you are my hero! How did you land back to the normal life after 6 years? I am happy you enjoyed reading our adventures, I also checked yours and I agree with you that “sailing family life is neither dream nor nightmare but simply a way of life of living day to day”. We homeschool aboard in the med, have done for three years now. It’s interesting that I’m just getting a project together similar to your……..erm, whatdoyacallit….. technology pillars?? ?